Really liked Dennis Rainey’s devotion today from Moments With You devotional. Debunks the fallacy that a strong man in the home is a threat to the wife/mom but rather correctly states that a man who leads his home spiritually, physically and courageously is a blessing to the health and viability of the family and its’ legacy. After speaking at a Promise Keepers event in Houston, I was met by a television crew offstage. The interviewer baited me by mentioning a group of women picketing the event and what they perceived as men being encouraged to take advantage of women. 63% of Americans have played a video game in the past 6 months, compared to only 53% of people who have gone out to the movies (NDP Group Inc., 2009). 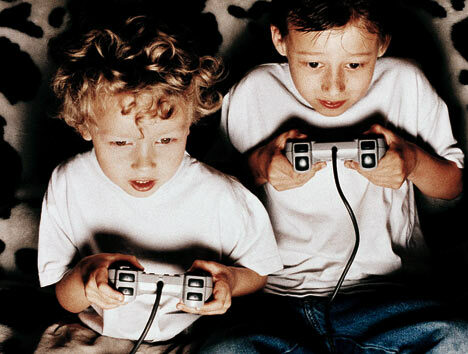 A study of over 2,000 8 to 18 year-olds (3rd through 12th graders) found that 83% of them have at least one video game player in their home, 31% have 3 or more video game players in their home, and 49% have video game players in their bedrooms (Roberts, Foeher, and Rideout, 2005). In the same study only 21% of kids reported that their parents set rules about which video games they can play, 17% reported their parents check warning labels or ratings on video games, and 12% reported they play video games they know their parents don’t want them playing (Roberts, Foeher, and Rideout, 2005). Did you read that last bullet? Only 21% of kids said Mom and Dad set rules about video game playing and 12% play games that they (kids) KNOW their parents don’t want them playing. Adolescents who play more than one hour of console or Internet video games have more or more intense symptoms of ADHD or inattention than those who do not (Chan, 2006). The most likely reasons that people play video games excessively are due to either ineffective time management skills, or as a symptomatic response to other underlying problems that they are escaping from, rather than any inherent addictive properties of the actual games (Wood, 2008). Online Gaming Addictions display core components of addiction such as salience, mood modification, tolerance, conflict, withdrawal symptoms, cravings, and relapse (Chappell, 2006). Both novice and expert online game players are subject to time distortion and have difficulty breaking off from the game without interruption by others in the real world (Rau, 2006). Video game usage may be linked to a lower GPA and SAT score (Vivek, 2007). Again, though there are pros of controlled video playing, there is almost no denying that it can be an addictive lifestyle that can have a negative long-term impact on our children. She had already earned high marks for unpopularity by limiting her boys’ game time to one hour a day. But when she came in one night before bed to tell them, “Time’s up,” they wanted to “finish a level” of their game before saving their progress. So they made a fatal choice: Instead of shutting the game off, they paused it instead . . . and returned to it in the middle of the night. When Mom woke up at 2 A.M. and noticed the light emanating from downstairs, she went ballistic at first. Then she disappeared into her bedroom and paced the floor in prayer, asking God for wisdom about how and when to strike. Finally resolved, she went in each room and began pulling plugs and boxing up every piece of game system she could find. Then—with her boys watching in horror—she opened an upstairs window in their three-story house and dropped the whole thing to the ground. Ah, the beautiful sound of smashing electronics! Drastic? Yes. But one of those boys left soon after for college with seven of his buddies. Before the first semester was completed, four of the seven dropped out and returned home to take part-time jobs so that they could have more time for video gaming. For one young man, however, the addiction was gone, thanks to a parent who cared more about her children’s character than their point totals or her popularity. If video games have taken control of your house, maybe it’s time for you, too, to bring your kids back to reality. In the MediaFamily.org study 1/3 of parents actually participate in the games with their children. So, it can be a time of family interaction and fun. There are some other positive benefits of video games. As in most things in life, the issue is one of “balance and intentionality”. My wife and I regulated the amount of time our children were able to spend in “monitor” time (an age appropriate amount of time daily that our children could spend in front of the TV + Computer). Nowadays you need to add in cell phone time as well. These are not easy decisions and I wouldn’t advocate going into your child’s room and tossing their computer and gaming equipment ala Howard Beale (played by the late Peter Finch) in the 1976 movie, Network, ‘I’M AS MAD AS HELL, AND I’M NOT GOING TO TAKE THIS ANYMORE!’ Though it may not be clearly evident the exact steps you need to take with your children, what is or should be evident is that steps do need to be taken to ensure your kids don’t get swallowed up by the video game allure. And, it’s much easier to implement some guidelines and boundaries earlier in their lives than later. So, what will you do today to help your kids be wiser users of media and video games? When will you say, “Enough is Enough”? Dad–Need Some Advice on Helping Your Daughters Date WELL? Win a Book to Help! If you answered yes to the question in the headline, then you’ve come to the right place. Yesterday, I said I would be a dad’s best friend by helping you create a way for you to win with your daughter and your inner conviction that dating shouldn’t be a battle zone between you and her. You can win on both fronts! Dennis Rainey, President of FamilyLife, has written a very short and practical book entitled, Interviewing Your Daughter’s Date. I have found the book very beneficial in helping me develop a strategy for getting involved in my teen daughters dating world without being shunned or hated (and I hope it will last into their pre-married dating as well). They needed to understood that my role as father is not to deny them the opportunity to date or to fight them about their dates. Rather, it IS to provide safeguards so that they feel protected and cared for IN their dating. When they knew that my love for them includes wanting them to date young men who a) have their best interest in mind, b) are grounded in their Christian faith, and c) desire to be admirable in their intentions they have been much more open to allowing me into their dating world. The opposite is too often the case: we (dads) are becoming too un-invested and unaware in our daughters lives (and sons too) of one of the most important rituals we go through as men and women—checking out the other for potentially being together for life. Why you want this tool in your “daddy arsenal”. Mistakes you’ve made in this area that other dads can learn from or things you’ve done well that we can also learn from you about. At the end of the March I will randomly draw 3 names from all who commented and send you the book to help you out. I will announce the winner on the blogpost for March 31. I hope it helps! **note that this is a personal giveaway and not affiliated at all with FamilyLife. I am purchasing the books myself and giving them away because I think it’s important for Dad’s all over to get involved in this area of their daughters lives and to do it well. That quote from George Banks, the dad in one of our family’s favorite movies (Father of the Bride-1991) is related to his daughter getting married. Well, our daughter isn’t getting married (hopefully she’d actually be dating someone first) but she continues to knock out the logical hurdles as we move closer to that date in the (very distant :)) future: Prom Night. In the last post I shared with you the way I, as a father, viewed this whole Prom thing. The idea of watching her dress up for a night that signifies her last major event before before graduation and then off to college, gives me a little pain, a little tear. And, seeing the price of the dress brings more pain, more tears. But that will all pale in comparison to the tears I will shed when I have to give my daughters hand away to the man God has brought to her for marriage. Currently, we are far from that. Prom night reminds me that we’re not as far off as it might seem (or as I might like it to be :)). Truthfully, I’ve been praying for both of my daughters’ wedding day since before they were born (and my son’s as well). Though there are no guarantees, I’m confident God will answer according to His plan for their lives. Yet, before we hear wedding bells we will hear door bells from some Neanderthals who come by to date our daughters. Dennis Rainey of FamilyLife (the ministry that my wife and I have served with for the past five+ years) has written a book entitled, Interviewing Your Daughters Date, and in it he has provided some great counsel for dads when it comes to meeting the knuckle-scraping young man who’s come to take your daughter out. The idea is to actually interview her date well before the actual evening arrives. 1) Make sure he understands that your daughter is the most precious gift in the world and she is God’s handiwork. You’ll have to get the book to get the whole interview down pat. GOOD NEWS!! Check back on Friday because I’ll be sharing how you can win a free copy of Dennis Rainey’s book, Interviewing Your Daughter’s Date.